Please send your comments before December 18th and support Alternative B - Manatee Viewing from Land Only, to make Three Sisters a true winter sanctuary for endangered manatees. Remember that 600 acres of Kings Bay will remain open for in-water viewing opportunities. Three Sisters Springs is less than 1 acre, and there are nearly 600 acres and many other places in Kings Bay that will still be available for swimmers and divers. Manatees come to Three Sisters Springs to rest and be warm. Thus the manatees are driven away from the warm springs and can suffer and die in the cold. 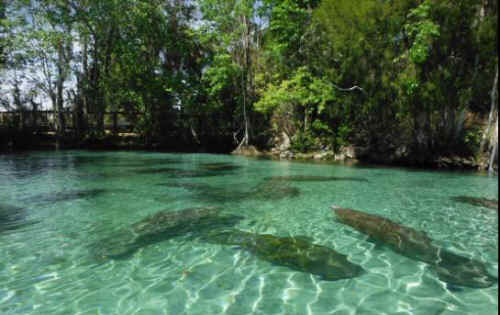 Recognizing the well-documented fact that manatees have been prevented from entering into and driven out of their preferred warm water winter habitat at Three Sisters Springs in Citrus County, Florida, the U.S. Fish and Wildlife Service (FWS) has released a revised Draft Environmental Assessment (EA) for Three Sisters Springs. The most recent Draft introduces a new Preferred Alternative, called Alternative D. This Alternative would still put snorkelers in the water inside Three Sisters. While fewer humans would be allowed in at once (13 vs. 29), more than 100 people per day would still be permitted to enter the spring,which will continue disrupting the manatees’ normal winter resting activities. The proposal will also continue to keep many manatees from using the warm-water refuge while driving others away and into colder water to avoid the swimmers and therefore will perpetuate continued manatee harassment. Keep in mind that Three Sisters Springs is less than 1 acre, and there are nearly 600 acres and many other places in Kings Bay that will still be available for swimmers and divers. The FWS recently extended the comment period on the EA until December 18th, 2015. Sadly, the very act of extending the comment period for these newly proposed protections will likely mean that manatees will continue to be subjected to the chaotic harassment already acknowledged by the FWS to be both illegal and intolerable.